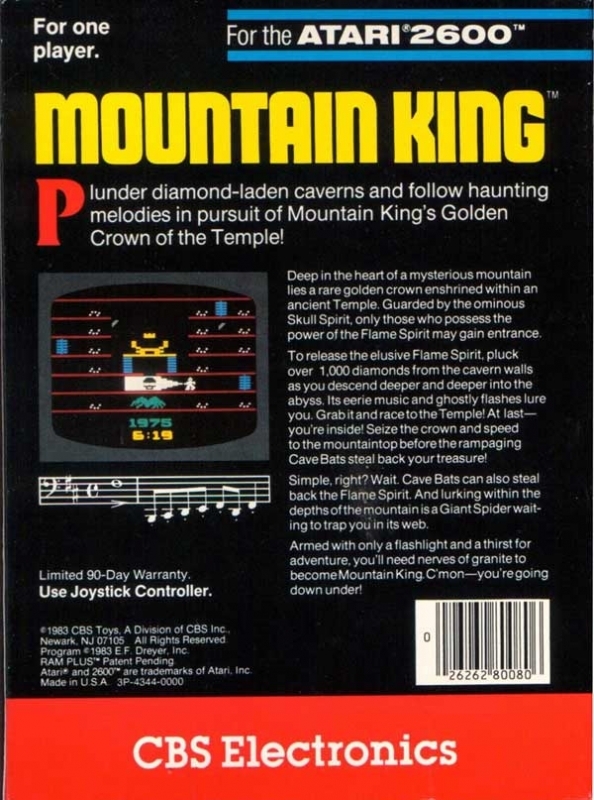 Deep in the heart of a mysterious mountain lies a rare golden crown enshrined within an ancient Temple. Guarded by the ominous Skull Spirit, only those who possess the power of the Flame Spirit may gain entrance. To release the elusive Flame Spirit, pluck over 1,000 diamonds from the cavern walls as you descend deeper and deeper into the abyss. It's eerie music and ghostly flashes lure you. Grab it and race to the Temple! At last - you're inside! Seize the crown and speed to the mountaintop before the rampaging Cave Bats steal back your treasure! Simple, right? Wait. Cave Bats can also steal back the Flame Spirit. And lurking within the depths of the mountain is a Giant Spider waiting to trap you in its web. Armed with only a flashlight and a thirst for adventure, you'll need nerves of granite to become Mountain King. C'mon - you're going down under!